A unique, high-energy experience that develops leadership habits, explores career opportunities in energy and engages students in the policies and issues that impact our state. Each year more than 40 high school juniors from 22 electric cooperatives across the state attend the Youth Leadership Summit. The summit teaches students to grow as leaders and helps them understand the important contributions that Tennessee’s cooperatives make to our state. They are also given an opportunity to see Tennessee government in action on Capitol Hill, sitting in on committee meetings and meeting with legislators. 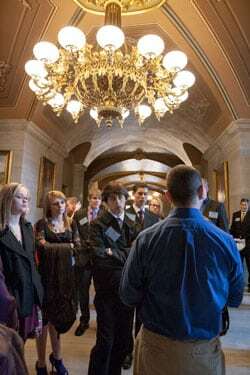 Through a highly selective process, local electric cooperatives, along with school officials and guidance counselors, chose participants based on their interest in government and strong leadership abilities. The Youth Leadership Summit exposes high school Juniors to state government and energy policy issues and fosters leadership development. Travel, food and lodging expenses are paid by local electric cooperatives and arrangements are coordinated by the Tennessee Electric Cooperative Association. Safety and security is always a priority before and during the trip. All chaperons go through an extensive background checks to ensure a safe, educational experience for students in a fun, interesting atmosphere.